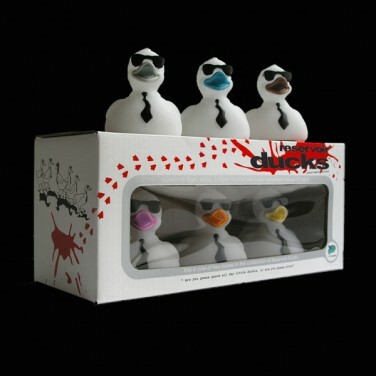 Now you can re-enact Tarantino's Torturous cult classic movie with light up rubber ducks thanks to the complete selection of Reservoir Ducks..
re-enact a bloodthirsty massacre while you relax in the bath, these little ducks are each dressed with a little black tie and a pair of dark glasse. Their coloured beaks indicating their 'code name'. 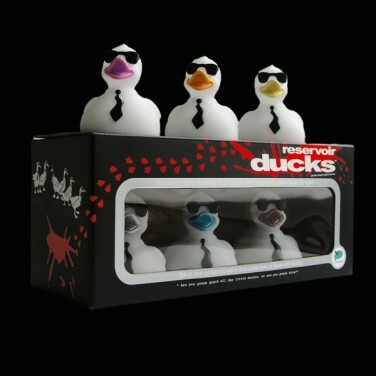 Two packs are available each featuring three reservoir ducks. If you order the double-deal below, we'll ensure you receive one of each boxed-set Or you can choose the box colour you prefer. Just place the reservoir ducks into the tub and watch the water-activated LED bulbs light up and change colour inside each one. They take like a duck to water! To keep the Glow in the duck series of bath-tub toys waterproof, the batteries are non-replaceable. Each duck comes pre fitted with super long life batteries which boast an operating time of 45 hours constant use - thats around 180 fifteen-minute baths.